There is nothing better than a casual styled sweater looking not so casual! I am an absolute fan of sweaters because of its versatility. Pair it with a blouse and you’ve got something more sophisticated but pair it with some random pants and sneakers and you’ve got an outfit perfect for hanging out! 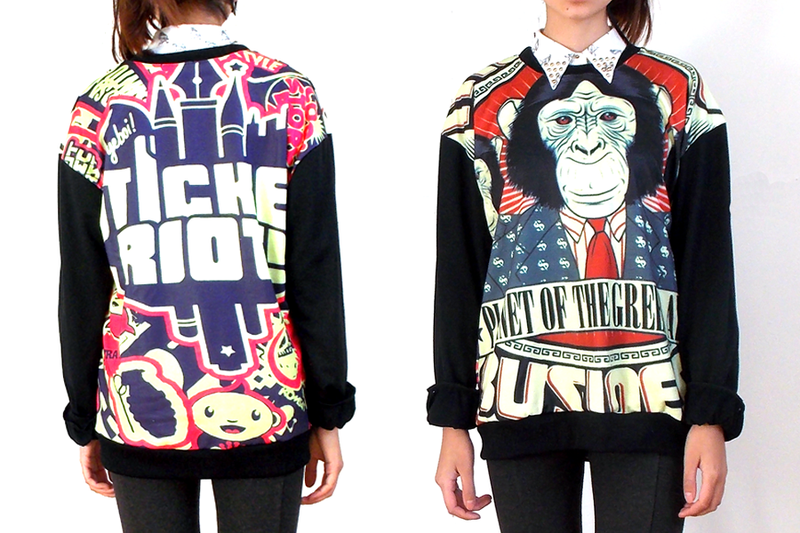 This sweater is about one thing: the monkey graphic. I love how it pops out and is in contrast with the black sleeves. What surprised the most is the back side. I thought the back was entirely black until I ripped the packaging open like a mad woman and found out that the back is also printed! Just paired it with some grey leggings and black shoes. The outfit it quite dark, but I promise that more colorful outfits will be on the way but for now we have to settle down with this one! Previous Post Previous post: Supporting local brands! Thanks for publicing this good information. Keep up the good work. I’ll subscribe to your weblog also. thnx! very nice look! love it! would you like to follow one another on bloglovin?